Our Health Administration Services bachelor’s degrees offer you knowledge and skills to succeed as a healthcare administrator. Healthcare administrators manage, direct and coordinate medical services in a variety of settings, such as clinics, hospitals, rehabilitation facilities and long-term care facilities. Responsibilities vary greatly and require skills, knowledge and abilities in areas ranging from medical services to business administration. As an administrator, you must also be able to adapt to the rapidly changing healthcare environment and increase in regulations. 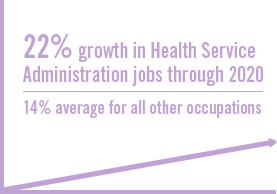 The job outlook for healthcare administrators is very strong. The U.S. Bureau of Labor Statistics projects a 22% growth in the profession through 2020, compared to a 14% average for all occupations. In addition, the aging population is creating additional demand for administrators across the country to manage an increasing number of healthcare professionals and facilities. We offer 3 bachelor’s degree options, so you can tailor your learning to fit your career goals. Provides you with the necessary skills and competencies required for supervisors and managers in health care settings. Prepares you to succeed in the growing field of health care coding and information management. Provides you with the skills and knowledge to meet the demand for qualified long-term care administrators. Health care is a rapidly changing industry. Individuals who have the skills, knowledge and abilities to manage change are in high demand. As a health service administrator, you will be in a position to make a significant contribution to how care is delivered. Entry and mid-level management positions include areas such as finance, government relations, human resources, information systems, marketing, public affairs, patient care, planning and development, staff relations and supply chain management. According to the US Department of Labor, jobs within the health care industry will increase in demand across the country faster than any other industry.